Dana Point Festival of Whales 2013! Posted by Teresa Mihelic HelpDesk on Tuesday, January 15th, 2013 at 11:55am. One of the wonderful things about living in Dana Point is the many events throughout the year that the city hosts. The Festival of Whales, is a signature 'small town' event packed with many activities, that include a parade, shows, street fares, classic cars and more. The Dana Point Festival of Whale celebrates the incredible 5000-mile migration of the majestic California Gray Whale from Alaska to Mexico that begins in December and continues through March. During this peak season, 40 – 50 whales pass by Dana Point each day, using the Dana Point Headland’s 200-foot cliffs near the harbor as a landmark to check their migration path. Dana Point offers the BEST whale watching along the California Coast . 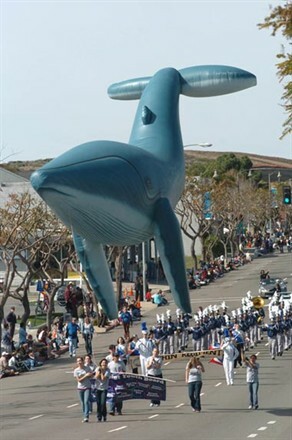 If you have never been to the Dana Point Festival of Whales, you should really make an effort to come, and enjoy their 42nd anniversary this year! The Festival goes one for two consecutive weekends in March: the 2nd and 3rd, and the 8th and 9th,starting with the Whale Parade and followed by with many activities and 'whale' related events, including food, movies, and runs. There will be whale watching, arts and culture, classic cars, diamond digs, music, parades, clinics, street fares, stand up paddling and more!! Don’t miss out on all the fun! We will be posting several of the events separately and giving you reminders. Keep checking us out for updates!!! Oh yeah, and if you want to know what's currently listed for sale in Dana Point, visit our Dana Point Real Estate site, and give us a call to schedule home tours! !